There are no reviews for Arsenal of Megadeth yet. You can write one. 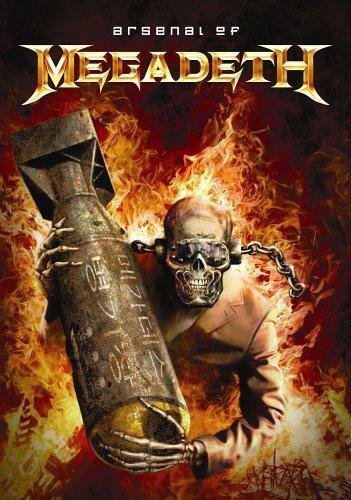 - Hidden treasures featuring Megadeth in rehearsal and on the video set. - Select play all from the main menu and when the year 1990 appears on screen press enter on your remote. - Select play all from the main menu and SOD (The Gristle Mix) (Video Edit) will play. If you select SOD from the track menu you get the regular SOD video. - Select play all from the main menu and about 5:49 into the DVD (during the Train Of Consequences video / chapter 2) Vic Rattlehead's hand will appear on screen for a few seconds (during the poker game) press enter on your remote. - Select play all from the main menu and 0:37 into the video for Trust Vic Rattlehead's hand will appear on screen for a few seconds (when a pay phone appears) press enter on your remote. Although not an Easter Egg, disc 2 track 24 will only play if you select play all from the main menu.